Clotilde Dusourier writes the blog Chocolate & Zucchini. 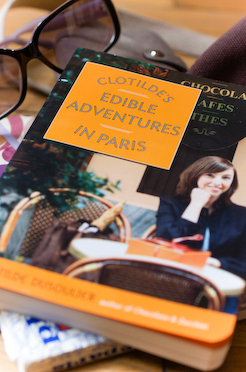 Clotilde’s Edible Adventures in Paris is a book on Paris restaurants and food shops, in which I share recommendations for my favorite spots — everything from neo bistros and salons de thé to bakeries, outdoor markets, wine shops, and much, much more, as they say — plus all you need to know to navigate the City of Light and Good Food, plus a dozen recipes. You can read more about the book, including reviews and excerpts, on the mini-site I’ve set up, and you should of course feel free to order your very own copy — no, really. I’ve only just received finished copies myself, and although it is hardly surprising for a young mother to fawn over her newborn, I am particularly pleased with how this book turned out — the way it fits snugly in my hands, the slight grain of the cover, the chic layout, the color photos, and the rounded corners (rounded corners! you know you love them!). So pleased, in fact, that I’ve been tempted to keep a copy under my pillow, but Maxence said no. The perpetual challenge for books that give real life recommendations is that real life stuff tends to shift and change over time. Thankfully, by the power and grace of the Internet, I will be able to maintain a list of updates, corrections, and bonus addresses on the above-mentioned mini-site — there’s even a “print before you go!” version to slip in the book and take with you to Paris.